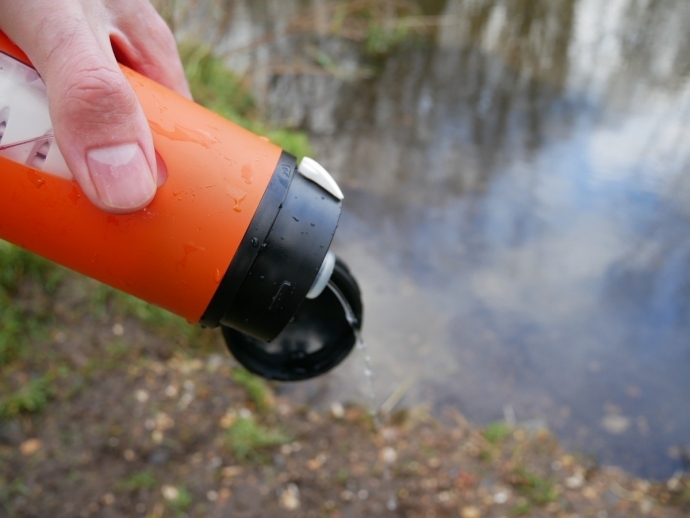 When the guys from LifeSaver got in touch and asked me to review their Liberty water filtration bottle, I gladly obliged, as it is one bit of kit i’m missing from my wild camping / backpacking gear arsenal. The LifeSaver Liberty bottle is designed for anyone that is spending a lot of time in the outdoors, that needs a regular supply of clean water to stay hydrated. That could be for backpackers, bikers on a road trip, wild campers, folk on expeditions, and so on. I took the bottle down to the Chess Valley in the Chilterns, and decided to test the water filtration of the river water. It’s not known for being the cleanest river, so I was risking my health a little, but I had full confidence the LifeSaver Liberty bottle would filter out the nasties from the river water. First off, if you are just carrying a day sack, the bottle isn’t particularly small or particularly light. Add to the fact it only has capacity for 400ml at a time, and it doesn’t seem the most efficient water filtration product on the market. With a weight of 425 grams, it isn’t the best product for backpacking, in my personal opinion, especially if you compare the capacity, weight and price of the standard Water-To-Go bottles, which carry 500ml of liquid, weigh less than 100 grams, and costs 80% less. It can purify 2000 litres of water before the filter needs changing – that’s a HUGE amount of liquid. 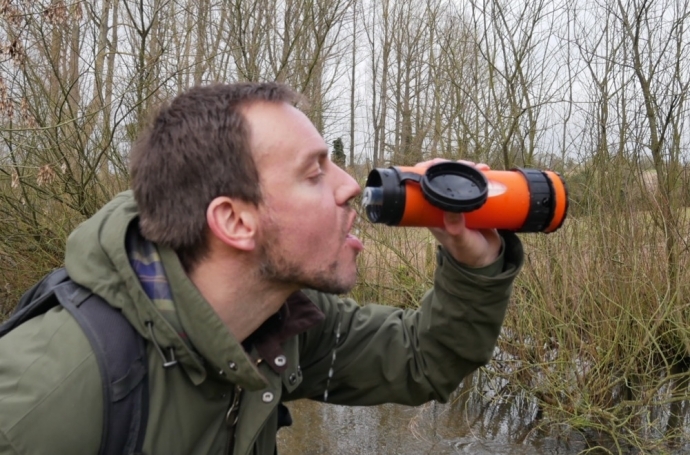 Compare that to the Water-To-Go bottles (130 litres) and you can quickly see how useful the Liberty bottle can be on big expedition trips, or trips around the globe. 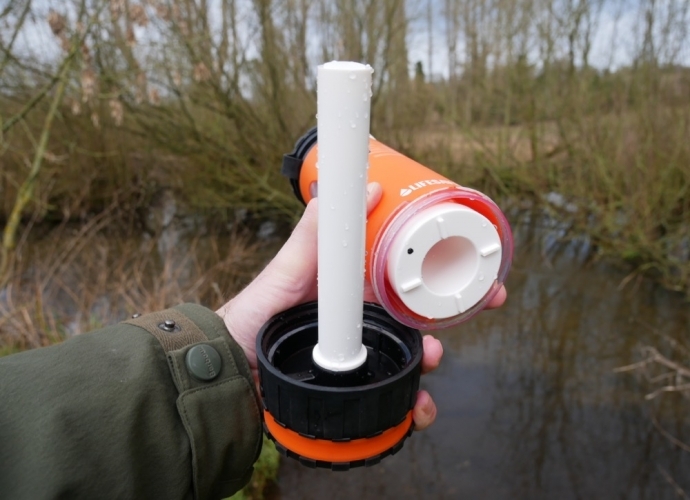 Built in pump – at first I thought this might be a bit of a faff, but the pump is both very useful and effective. So much so it that is has a pretty fast flow rate – up to 1.2 L/min. Trusted brand – International aid agencies and militaries around the world have used LifeSaver’s filtration technology for over 10 years. Not many water filtration brands can make that claim. It comes with a Scavenger Hose – this 5ft tube is a very useful addition to the bottle indeed. In fact it is the only bottle that comes with an in-line hose to syphon water, I believe. If you can’t quite reach the water source, or don’t want to get your hands wet dipping the bottle in the water to fill it up (maybe because of freezing conditions), then this hose comes in very handy indeed. Just drop the hose in the water, start pumping using the built in pump and voila, clean water out of the other end. Great if you love Nalgine bottles – the LifeSaver Liberty bottle is designed to fix directly onto the screwable neck of a wide-mouth Nalgine bottle. 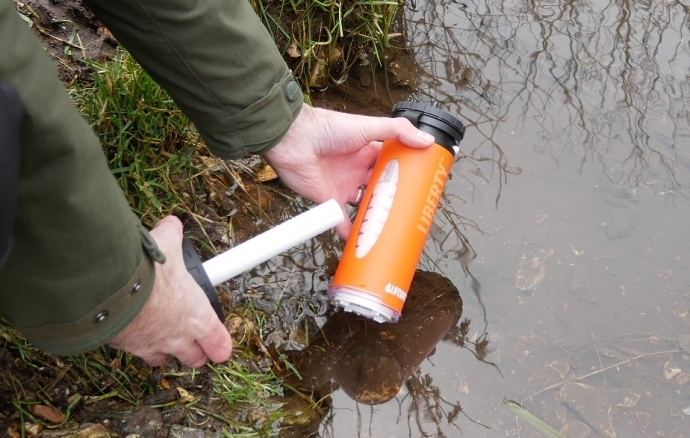 So using the Scavenger hose, you can filter clean water directly into your Nalgine bottle. This is perfect if you’re in a group, and everyone with a Nalgine bottle needs a top up of clean, fresh water. Before you first use the LifeSaver Liberty bottle, you need to prime it. This involves filling it with water and pumping it out a few times in order to clear the filter. 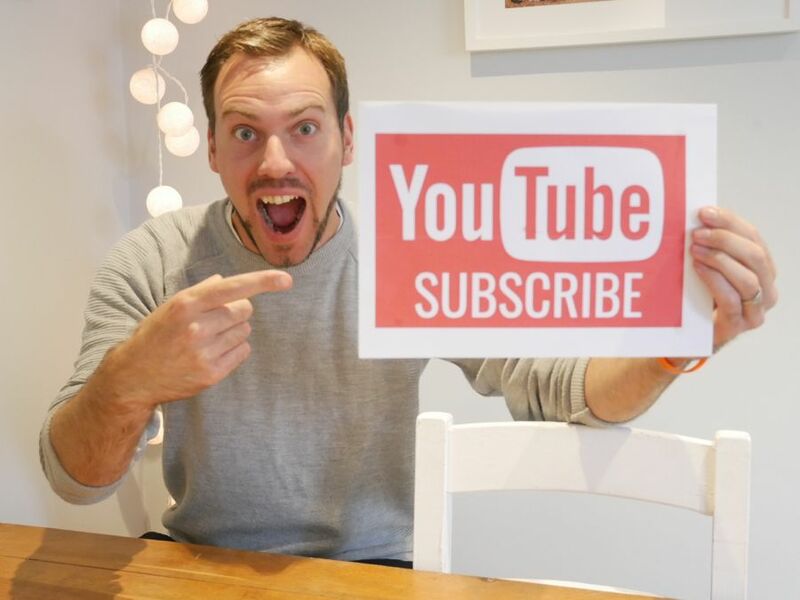 It also needs to be stored with a little water in the filter compartment at all times, because if it dries out then the filter won’t work, and a new filter costs around £50. 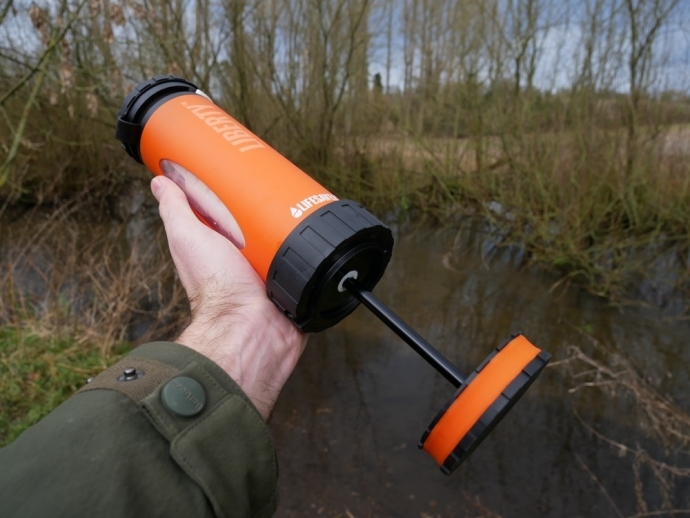 The LifeSaver Liberty bottles removes virtually all viruses (99.999%), bacteria (99.9999%) and cysts 99.99%), so I was fairly comfortable that when I tested it on water from the River Chess, I wouldn’t come down with some nasty waterborne lurgy over the next 48 hours (which I didn’t). I initially found the pump and white flow lever a little tricky, but so long as you pump three times when the flow valve is closed (horizontal), and then open the valve (vertical), and continue to pump, it all works out fine. Overall I think the LifeSaver Liberty bottle is a brilliant addition for long trips overseas, family camping trips, or group expeditions, but I wouldn’t necessarily recommend it for short, solo backpacking trips as it would take up too much space and adds too much weight. The bottle retails at £89.99, and you can buy direct, or on Amazon. For more information on the LifeSaver Liberty bottle, visit the LifeSaver website. A great water filtration bottle from LifeSaver. 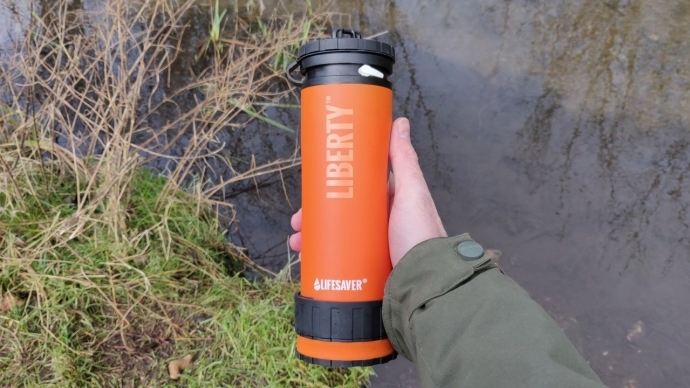 LifeSaver have been producing market-leading water filtration products for the last 10 years, and the Liberty bottle is a great addition. 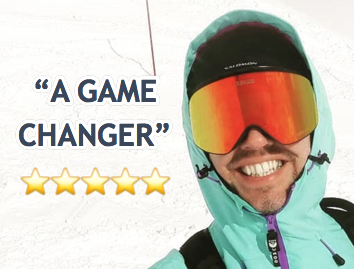 Ideal for wild camping trips, family camping trips or group expeditions in the UK and overseas, the Liberty is a good option to have in your outdoor gear arsenal.